WordPress vs WordPress: it’s like MAD Magazine’s Spy vs Spy, but way more serious. And as with black vs white spies, WordPress vs. WordPress goes way beyond blue vs grey. We found this chart comparing WordPress vs WordPress (.com hosted WordPress vs .org-download-and-host-it-yourself, that is) in the post linked below. And while quite a lot of the things you’ll find in the article might seem obvious, the idea of a simple chart comparing WordPress vs WordPress, right up there at position #1 is … well, not exactly mind-blowing, but pretty darned useful—if only academically. 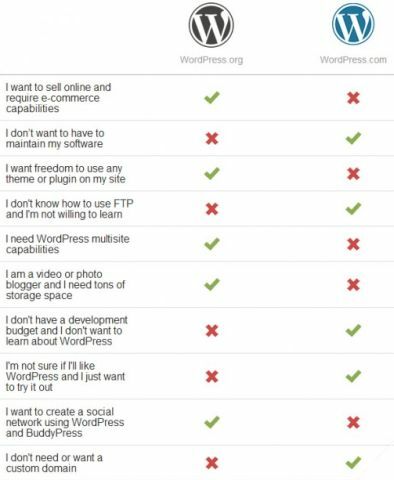 I mean, if you’re reading this, or have given the subject of WordPress vs WordPress any thought at all, you already knew there were differences. And you might not understand all of them (which of course is why we’re here). But looking at WordPress vs WordPress not merely laid out so simply but showing that every point being compared comes down as WordPress.com taking an opposite position to WordPress.org provided a bit of food for thought; yes, even for us. In the simplest sense, because self-hosting just isn’t that hard, can be incredibly inexpensive, and provides oodles more flexibility, when people look at WordPress vs WordPress we’ll recommend going the self-hosted route in virtually 100% of cases. And that’s before any discussion of who gets your advertising revenue or the benefit of your Search Engine Optimization efforts! But this table is … well, it’s pretty cool. WordPress vs WordPress? You bet. What happens at WordPRess.com is different from how things work when you grab the free software at WordPress.org.